It’s holiday cookie exchange time! Yes, it’s not even December yet, but Thanksgiving is over so bring on the cookies. The more the merrier. 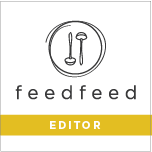 Earlier this month, I casually mentioned to fellow feedfeed editor Rebecca Firth that I wanted to exchange cookies with her this holiday season. She makes the most delicious cookies on her blog Displaced Housewife (among other drool-worthy foods). Rebecca took me at my word and turned it into a holiday cookie extravaganza. Today, she’s brought together 18 cookie-loving food bloggers to participate in the first annual #holidaycookieparty2016! Over the past week, we’ve all been shipping out cookies to each other Secret Santa style. I received a festive holiday box of white roll-out cookies, peanut brittle, and divinity from Chez LaRae and felt completely spoiled rotten. My offering to the holiday cookie party comes in the form of these Vanilla Bean Marshmallow & Pink Peppercorn Shortbread Cookies. Fluffy marshmallow mounds with a buttery shortbread crunch. 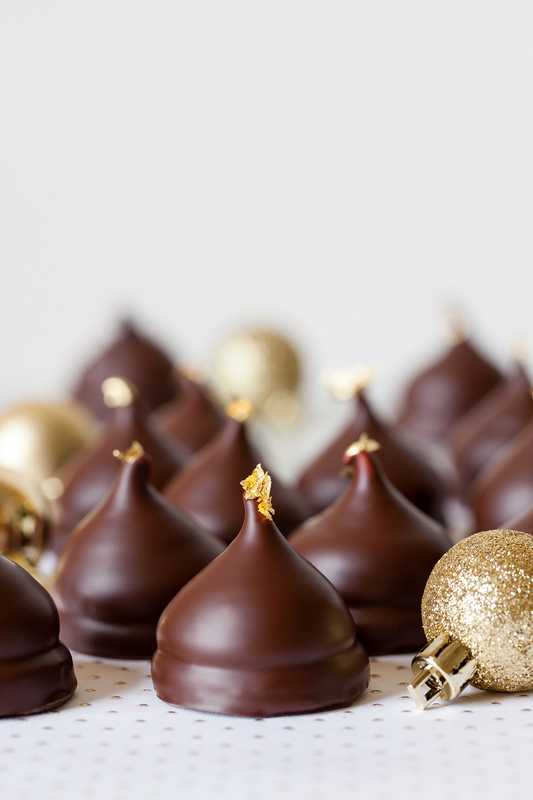 All coated in chocolate with a fleck of edible gold for holiday glamour. 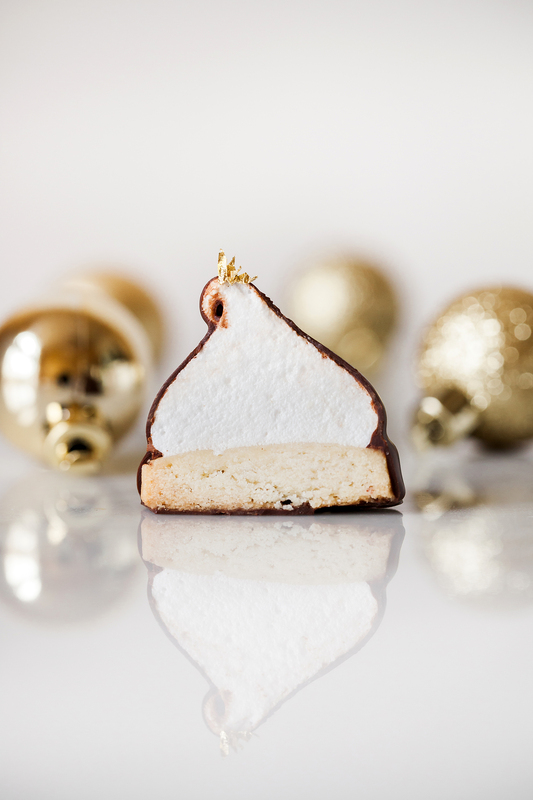 These cookies are made up in two parts: shortbread and marshmallow. The shortbread is peppered with a light touch of finely crushed pink peppercorns and vanilla bean seeds fleck the marshmallows. If you like a stronger bite to the pepper flavor, then by all means add more pink peppercorns. Be sure to save any leftover marshmallow fluff for December’s hot chocolates as well. These cookies can all be made the same day; make the shortbread and while they’re cooling make the marshmallows. When the cookies have set, temper the chocolate for coating (the ‘how-to temper chocolate’ link provided in the recipe). If you don’t want to bother with tempering chocolate I’ve also included an alternate option for chocolate coating. It doesn’t set with the same firm ‘snap’ as tempered chocolate and takes a bit longer to set, but it still tastes delicious. Edible gold leaf can be ordered online or feel free to use whatever garnishes you currently have in the cupboard. Enjoy these festive cookies for upcoming holiday parties and be sure to check out #holidaycookieparty2016 on Instagram. Visit all the delectable links, at the bottom of the page, for even more cookie recipes. Happy Holidays! In the bowl of a stand mixer, on medium-high speed, cream together the soft butter, powdered sugar, salt, pink peppercorns, and vanilla extract for about 2 minutes. Add flour and mix, on low, just until combined. Be careful not to overmix the dough. Place shortbread dough between two large pieces of parchment paper and roll out to 1/8-inch to 1/4-inch thick. Rolling dough between parchment paper prevents any extra flour being added to the dough while rolling or dough sticking to the counter. Transfer dough onto a large baking sheet and place into the freezer for 20-30 minutes to chill. Meanwhile, preheat oven to 350F (176C). Line a large baking sheet with parchment paper or Silpat. 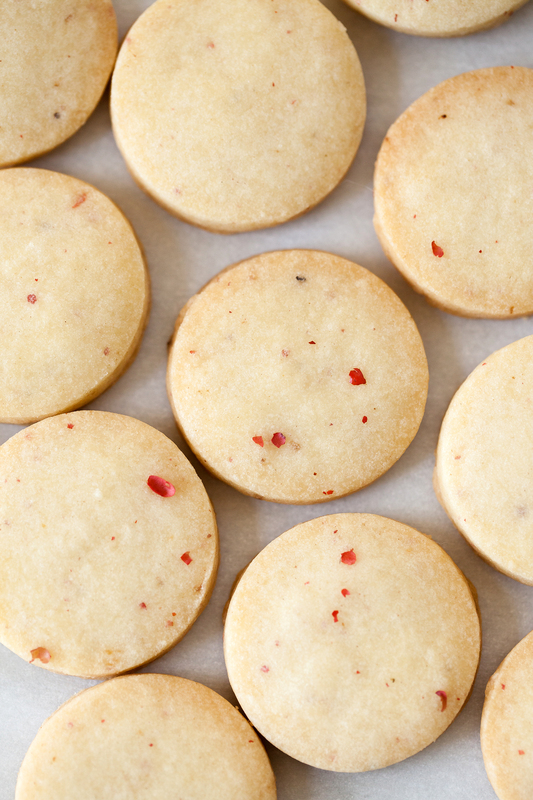 Remove chilled dough from freezer and cut out 1 1/2-inch rounds using a cookie cutter. Place shortbread on lined baking sheet, spacing 1-inch apart, and bake for 13-15 minutes or until edges are golden. While first batch of cookies are baking, gently press together dough scraps, reroll, cut out rounds, and store in the freezer until ready to bake. Remove shortbread cookies from the oven and set on cooling rack until completely cooled. In the bowl of a stand mixer, sprinkle the gelatin over 3 oz (85ml) cold water and set aside to bloom. In a small saucepan, bring remaining 3 oz (85ml) water, sugar, light corn syrup, honey, vanilla bean seeds, and fine sea salt to a boil. Cook mixture to 250F (121C). If needed, brush down any crystallizing sugar from the sides of the pan with a pastry brush dipped in cold water. Meanwhile, attach the mixer bowl to the stand mixer fitted with a whip. Once the hot sugar syrup has reached 250F (121C) immediately remove it from the heat. Turn the stand mixer onto low and carefully pour the hot syrup down the inside of the bowl onto the bloomed gelatin. Gradually add hot syrup until it’s all added (mixture will look watery). Turn mixer speed up to medium and let whip until it begins to cool and thicken, about 10 minutes (careful not to ‘slosh’ out any hot syrup mixture when turning up the speed). Once thicken and opaque, turn the mixer speed up to high and whip until cooled, about 10-15 minutes. Marshmallows should form smooth stiff peaks when ready. Meanwhile, prepare countertop work space for cookie assembly. Once the marshmallow mixture is ready you must work with it immediately before it sets. Once all the cookies have been piped, spread out any leftover marshmallow onto a piece of parchment paper and let set. Cut into cubes and coat in powdered sugar. Use for hot chocolate or freeze, in an airtight container, for up to three weeks. Line up pink peppercorn shortbreads on a large cooling rack. 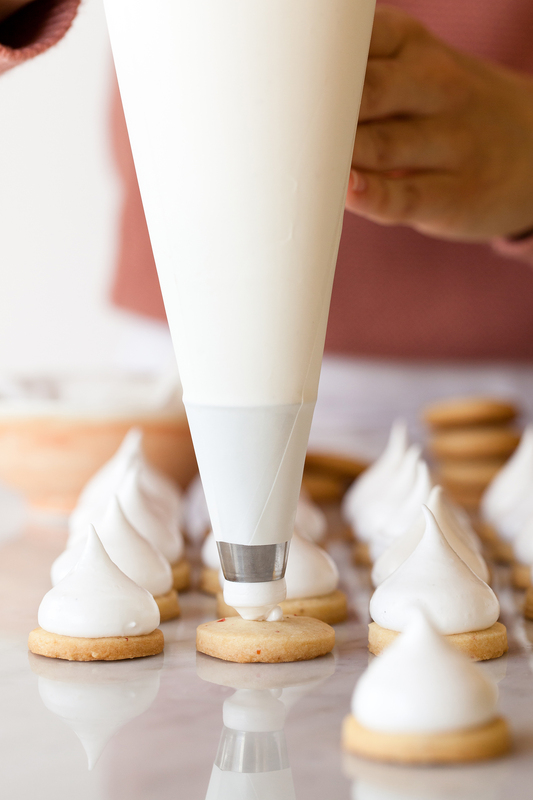 Fit a piping bag, with the tip cut off, with a large Ateco 808 round tip. Fill the bag with freshly prepared marshmallow and hold the pastry bag tip directly over the center of one cookie (90-degree angle). Gently squeeze the pastry bag until the base of the cookie is covered in a mound of marshmallow and then slowly pull ‘up’ to form a peak. 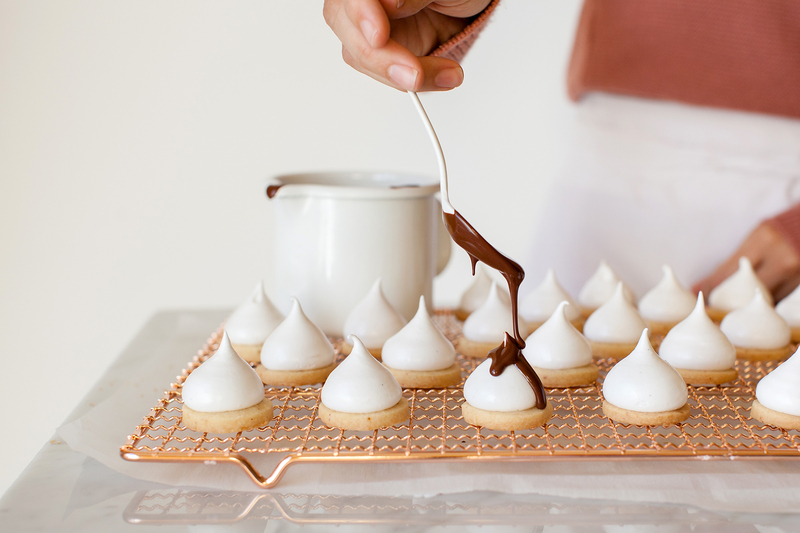 Continue this process until all cookies have been covered with marshmallow peaks. 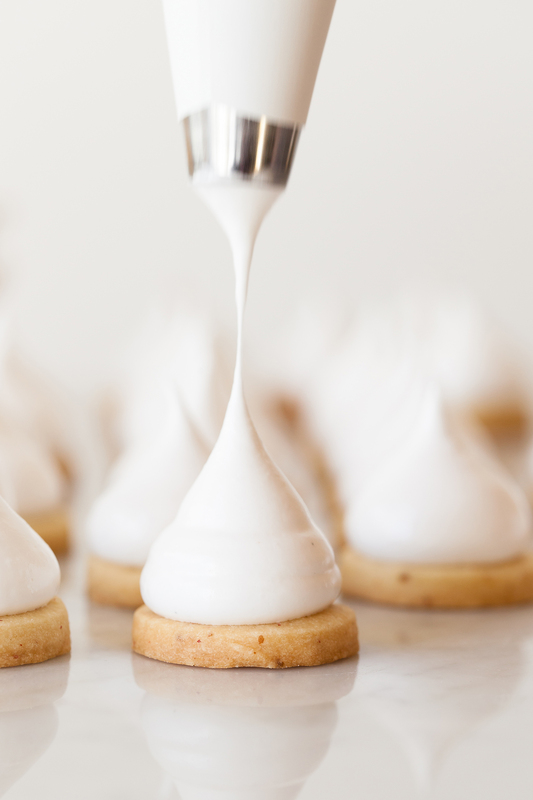 Allow cookies to set for at least an hour or until marshmallow can be touched without smearing or changing shape. Prepare tempered chocolate for coating. If skipping the tempering process, then mix together melted dark chocolate and cocoa butter (or refined coconut oil) in a bowl. Mix very well in order to prevent oil streaks when set. Set a large piece of parchment paper under the cookie cooling rack. 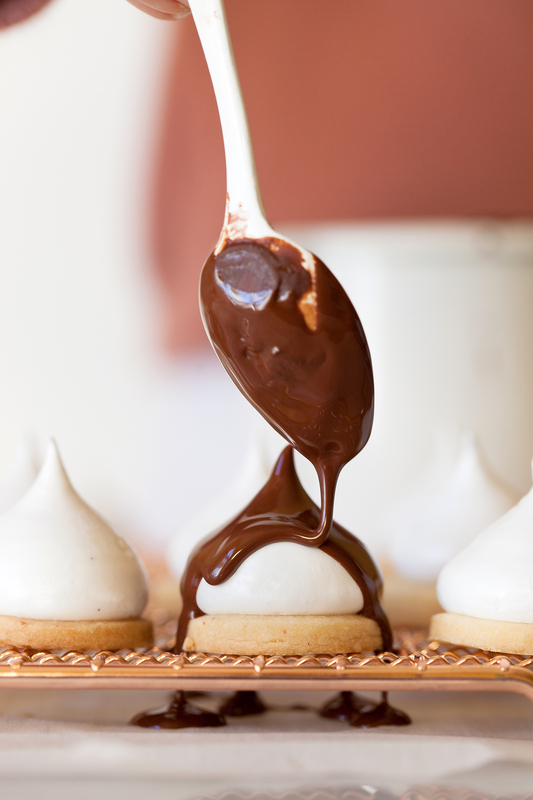 Dip a spoon into the chocolate and then carefully pour it over one cookie until completely coated. With a small pairing knife, carefully place on a sliver of edible gold leaf to the tip. Repeat with the remaining cookies until they’re all coated and garnished. Let set for at least 1 hour or until cookies can be touched without leaving fingerprints. Store Vanilla Bean Marshmallow & Pink Peppercorn Shortbread Cookies in an airtight container, at room temperature, for up to five days. They’re best enjoyed the day they are made. i feel like a lot of things end up feeling heavy (all that chocolate and caramel is delicious but whew when there’s a whole month filled with chocolate-y, caramel-y goods!) during the holidays, so i love how light and slightly spiced these sound! Thanks, Heather! I completely agree and these cookies are fluffy and light for sure. Hope you enjoy them! Thank you, Amisha! You’re cookies are BEAUTIFUL. That was one lucky recipient on your end. ;) All the cookies were spectacular and it was such a fund day! We’re going to be fully stocked with cookie recipes this month. Thank you, Rebecca! Sending you all the love right back and hoping that you’re feeling much better now. If not, curl up with some cookies and a good Netflix series. You rocked this virtual holiday cookie party! Thank you, Lauren! Wishing you a cookie-filled holiday season. These have to be the most gorgeous cookies I have ever seen Teresa! They sound absolutely delicious too! So happy I got to participate in the swap with you! Thank you, Mary Ann! I’m so happy we were able to be apart of this together as well. Rebecca did a wonderful thing bringing us all together. It was an exciting day! These are stunning! They will definitely be on the holiday cookie list this year. Your recipes are always so inspiring! Lauren, you’re the sweetest. Thank you! These are beautiful, we call these teacakes in the UK. I love how shiny and well tempered the chocolate looks. Thank you, Rachel! This year’s cookie swap was a lot fun and I’m so glad you were able to be apart of it too. Happy Holidays! Teresa, these are one of the prettiest stunning cookies ever. You are an artist and such a fabulous photographer. I am in awe of your talent. In love with this and I might give it a try. LOVE!! These cookies are stunning! I love the vanilla marshmallow/chocolate thing happening (you wouldn’t right?! ), but the addition of the pink peppercorn is nothing short of brilliant. And delicious I’m sure. This cookie party was so much fun!! Can’t wait for next year. Thank you, Samantha! It was an exciting day for cookie lovers. :) I like how you’re already thinking about next year! Wow, these are absolutely gorgeous, Teresa! Love that fluffy cloud of marshmallow inside too…yum! Thank you, Joscelyn! There are so many new cookies to try. It’s heaven! These are so beautiful that I wanted to make them the moment I saw them! And I’m not usually one to make a cookie that has this many steps. 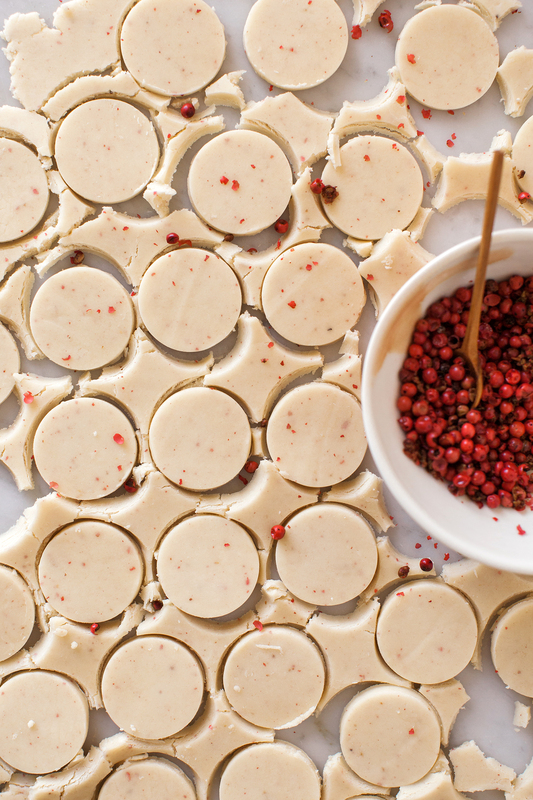 I made the shortbread last night with the pink peppercorn and I made a batch with vanilla bean and lemon zest for the kids–they loved the pink peppercorn too, so no need to mess with the recipe. I do have a question, however. It seems yours are rolled out thicker than 1/8-inch. The ones I got that thin were very thin wafers. Buttery and flakey. Should they be 1/4-inch instead? Or even a tad thicker? Thank you! Happy to know that you made these and that the whole family is enjoying them! Love that variation of vanilla bean and lemon zest too. I actually created two batches, one at 1/8-inch and one at 1/4-inch, and preferred the thinness of the 1/8-inch for the final cookie (with marshmallow piping and chocolate coating). It produces a less ‘bulky’ final cookie. However, if you like a thicker cookie then go for it! :) Especially, if you’re only making the shortbread part of it and skipping the rest. I’ll add this note to the steps above. Thanks for stopping by, Jenny! This is so gorgeous and a great recipe for shortbread. I adapted the flavors while keeping the flour, sugar and butter quantities. Thanks for sharing.